A: We like you just the way you are, though if you feel like dressing fancy we won’t object. A: As a cocktail bar, we strongly encourage all our guests to take advantage of Uber and Lyft. However, responsible drivers will find street parking (free & metered) on 36th Street and its side streets. Interested in valet? Located across 36th Street, The Food Market kindly allows our guests valet access, for a fee. Q: I see you only permit entry to ages 21 and up (including babies). Could you explain that to me? A: Happy to! 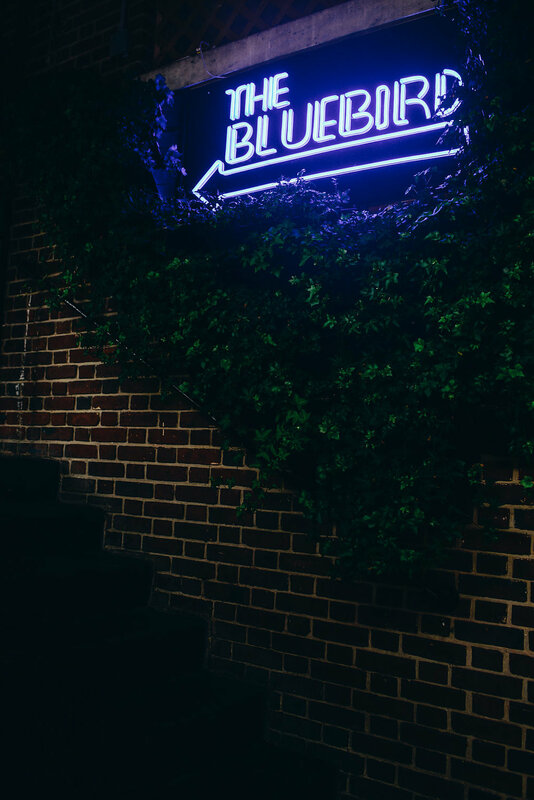 The Bluebird is a cocktail bar intended for adults to enjoy an adult experience. Please understand that, while we know your baby or toddler won’t be imbibing, he or she may behave in a distracting manner to our other guests, despite your best efforts. Q: My child is 18, can he or she join us for dinner? A: While we sincerely wish responsible young adults could join us, we strictly enforce the legal drinking age at the door, to ensure mistakes on our part, and temptations on your’s, don’t happen. Q: I have an allergy/dietary restriction, what can I have? A: Lots of menu items are available, or can be modified, for those with allergies or dietary restrictions. Please notify your server of any allergies or dietary restrictions, who, in tandem with our management and chef, will ensure you have a safe and enjoyable experience. While we will do all we can to accommodate guests with food intolerances and allergies, we are unable to guarantee that dishes will be completely allergen-free. A: We accept reservations for parties of 6 or less on Friday and Saturday nights only. All other seating is first come, first served. We strongly discourage groups larger than 16 as it becomes very difficult for us to provide you the level of service you deserve. If you do plan on bringing a group, it’s always best to send us an email beforehand. For information regarding events, please visit our events page. Q: We’re celebrating! Can I bring a cake and decorations? A: Bring the cake! A $20 plating fee will be added to your bill. Please notify a staff member when you arrive, and we’ll take it from there. We prefer our ambiance as is, and kindly ask you to leave all decorations, like balloons, at home.